The Lensbaby LM-10 Sweet Spot lens is one of two lens attachment packages I have for my iPhone. The other being an Olloclip 4 in 1. This article is not sponsored. I purchased the lens and wanted to share some thoughts and results. I bought the Lensbaby Sweet Spot lens as part of its Crowdfunding launch as soon as I saw the ‘Lensbaby’ name. I have written previously about my attempts to mimic the effect of tilting the focal plane (traditionally achieved by tilt-shift lenses, Lensbaby lenses or freelensing) so the idea of playing with the focal point via optics on my iPhone filled me with interest. This article is a short one to share the results of 15 minutes playing with the lens whilst I was walking Rigby (the dog) with my son and daughter. To mix it up a bit I processed each image with a different black and white lens and film combination in Oggl. The sweet spot very rapidly fades away to extreme blur. The sweet spot is tiny and at its sharpest when quite close to subjects. (Thank you to my lovely assistant). The wide disks of out of focus light bokeh increasing in size as they move further away from the sweet spot are very authentic. This image highlights that certainly during my playing the sweet spot becomes softer with distance. The Lensbaby LM-10 Sweet Spot Lens has a very small sweet spot which without the accompanying app is always centered. When viewed through the traditional camera app or your favourite camera replacement app the optics make the image appear upside down (rotated through 180 degree, not flipped). Originally the lens was attached to the iPhone by a magnetic ring stuck around the lens. Recently, Lensbaby produced a clip on adapter which the lens can be attached to instead. As much as I really enjoy playing with the lens I am not a fan of the app. 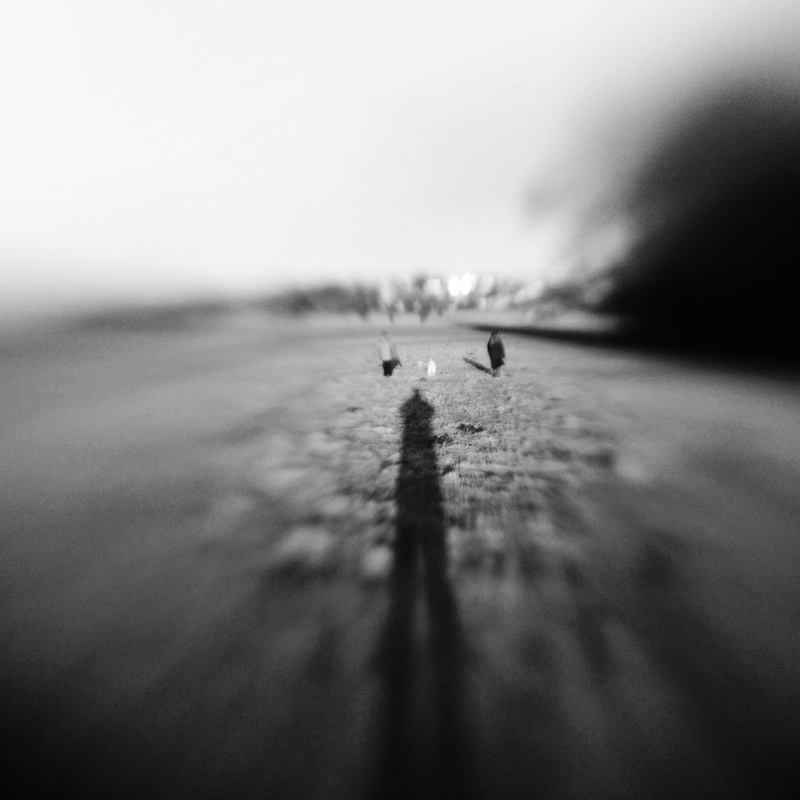 I downloaded the free Lensbaby app which corrects all of these issues. In the end I used ProCamera8 to capture images. I just had to get to grips with moving the iPhone in opposite directions to frame the image and get the sweet spot where I wanted. It has an option to move the sweet spot around the frame. It corrects the rotated image issue. When framing the subject and generating the image everything appears correctly orientated on the iPhone screen. The option to move the sweet spot around is actually a crop. All it does is zoom into the image and allow you to move the portion of the image being captured with your finger giving the impression that the sweet spot is moving. Effectively therefore we are actually cropping the image at the point of capture. This is demonstrated when looking at the output resolutions. On my iPhone5 an image without movable sweet spot enabled is saved at full resolution (3,264 x 2,448). An image with movable sweet spot enabled is saved at 2,310 x 1,734. The movable sweet spot does allow very accurate positioning but that aside, I prefer to perform any crops in post processing. The buttons within the app are incredibly small and positioned close together. I found it impossible to select or deselect them ‘in the field’. With a bit of practice, it’s actually quite good fun trying to frame images with a more powerful traditional camera replacement app. The issues aside though, it is good to have the app as an option. The nature of the Lensbaby Sweet Spot optics mean that some may prefer to use it. Oggl what’s not to love about this app! I hope you enjoyed my first look at the Lensbaby LM-10 Sweet Spot Lens. Please share your thoughts in the comments. Thank you for reading and I hope to see you again. If you enjoy my work and would like an email when new articles are published (rarely more than one per week) please subscribe to Skipology. Thank you for your support. When I first heard of Lensbaby for iPhone I was excited and was very close to participate to the crowdfunding; the reason I did not was the lens attachment system that I found not convincing. From what I see from your test photos I am even less convinced, I don’t like much the bokeh of this lens, it looks way worse than the reflex versions. Thanks for this precious info Paul, your blog is always a mine of treasures. Hi Davide, thank you yes still much playing to do with this one. The bokeh is extreme – probably too extreme too quickly. I’m not familiar with Reflex though must admit. So far I’ve found quite a good use, to get small targets for a painterly edit because the lens blurs out surroundings really well and almost sees through things because of that, but they are still heavy edits.